Have you heard of this Charlotte hidden gem yet? Just a short walk from uptown is a little hidden utopia in Charlotte. This little utopia is Gateway Village. It boasts the Gateway YMCA, a Starbucks, Chick-Fil-a and multiple fantastic bars and restaurants that are cannot miss spots. You may be wondering, or thinking to yourself, oh yea, this is one of those new spots opening up in some renovated building, right? Negative. Gateway Village has been around since the early 2000’s but recently has become buried behind, under, and around all sorts of construction. “Wait, what?” You ask. Yes, this little part of town is hidden currently by a ripped up road that only goes one-way right now (Trade) and intimidating traffic signs. Do not let the aesthetics discourage you. Now is the time to go check it out, before the masses show up once that construction ends and the cross-town trolley is bringing everyone. Not only is this a great spot to go for lunch during a big work day (hitting up a food truck or one of the restaurants), but also a place to hang out after work and on the weekend as there is ample seating both in the sun and shade. 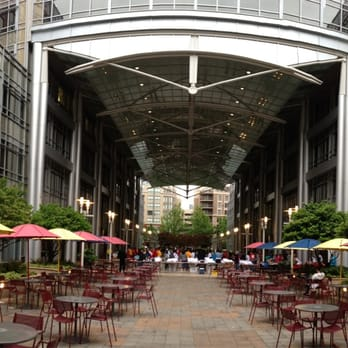 On select Fridays, in the open-air atrium area, there is a small farmer’s market with local goods. Today, though, we are going to chat about a few spots that are wonderful for post work gatherings. Bisonte Pizza – Fantastic pizza, fantastic wings, and apparently the “best of Buffalo.” The spot owned by a couple of brothers has great daily specials and a welcome, heart-warming neighborly attitude. Pub at Gateway – A little place tucked away in the middle of the building, this spot is easy to miss. It makes you feel as if you have stepped back into your favorite local (college) bar. However, here, the floors are not sticky and the food is incredible. The chalkboard on the right wall when you walk in helps to guide your beverage decisions by explaining the specials and specialties on tap. Cedar Street Tavern Bar – The opportunity to sit outside and enjoy a cold beverage is right at your fingertips and under some shady trees on the Cedar Street patio. This neighborhood bar will not only keep you fed and hydrated, but will also keep you entertained- from Trivia nights to Open Mic nights, there is something for everyone (and at every hour).